An ion is an electrically charged atom or molecule formed by the loss or gain of one or more electrons, as a Positive Ion (cation) which is created by electron loss, or as a Negative Ion (anion) which is created by an electron gain. These terms were introduced by English physicist and chemist, Michael Faraday in 1834. Ions can be created, by either chemical or physical means, via ionization. Yet, ions are ubiquitous in nature and occur naturally in the air that surrounds us. The air around the mountains, forests, waterfalls and sea sides, has the highest density of Negative Ions. This phenomenon is called the Lenard effect or the waterfall effect. Based on several experiments, the German physicist and Nobel Prize for Physics in 1905 for his research on cathode rays, Philipp Lenard scientifically proved that the air tends to be charged more negatively where water splashes. These types of environment make us feel calm, relaxed and rejuvenated because Negative Ions increase oxygen flow to the brain – keeping us more alert while improving our memory and mental energy. Negative Ions therefore balance out the positive ions found in polluted air – haze, smog, electrical radiation, air-conditioning, etc., which are bad for our health. A study by the Japanese Ministry of Health, Labour and Welfare shows that many medically unexplained symptoms in Western medicine, such as insomnia, shoulder pain and back pain might be related to the deficiency of negative ions in the body. Negative ions are negatively charged particles. There is 20% of positive ions and 80% of negative ions in a new born baby. This ratio is most beneficial to the body. However, the content of negative ions in human body will decrease while the content of cations will increase, contributed by aging process and other circumstances such as changes in the weather. The change in the ion content in the human body leads to the formation of viscous and acidic blood. Furthermore, it also hinders nutrient absorption process, waste elimination process and metabolism process. As a consequence, the overall body function becomes weak and leads to all kinds of illnesses. Induction of “Civilisation Diseases” due to Ionic Imbalance in the Environment”. More and more urban people who work long hours in the office are affected by the air-conditioning induced illnesses - cold limbs, headaches, backache/lumbago, physiological malfunction, insomnia, etc. This is due to the mass production of positive ions during the rapid cooling process of air-conditioning. “Viscous blood” is the main culprit of modern illnesses. However, it can be improved through blood purification process, which will improve physical fitness; prevents blood turbidity and stickiness; and prevents the slowdown of blood flow. Conditions such as reduction of the oxygen content in the blood, accumulation of lipids, slowdown in metabolism rate, chronic illnesses, high blood pressure, diabetes, gout, arteriosclerosis, fatty liver disease, etc. might lead to more serious problems such as stroke and myocardial infarction. The ability to enhance the “power of self-restoration”, the ability to resist oxidation inside and outside the body and the good functionality of body cells are determined by cell permeability. Our skin, bones, blood and organs are constituted by 6x1013 cells and pathological changes in these cells are a source of all illnesses. The pores in our membrane cells will shrink if there is more positive ions outside the cell. This phenomenon prevents the transportation of oxygen and nutrients to the cells and the elimination of waste products from the cells. Negative ions strengthen immune system and improve sensitive-prone conditions. Negative ions strengthen immune system by enhancing cells of the immune system and the engulfing capability of phagocytes in the white blood cells. Despite intrusion of germs and pathogens, with strong immune systems, we will not fall sick easily. Even if we fall sick, we will make quick recovery. Furthermore, negative ions also enhance the speed and quantity of antibodies produced by the lymphocytes. Experts have discovered that certain illnesses with certain unexplained symptoms that cannot be cured in modern medicine are due to malfunction of autonomic nervous system. The irregularity of modern lifestyles and increase in pressures in life interfere with the normal functions of sympathetic nerves and parasympathetic nerves, causes hormone imbalance, physiological malfunction and autonomic nervous system malfunction. The symptoms of autonomic nervous system malfunction are insomnia, migraine, nausea, frequent urination, poor appetite, tiredness, fatigue, etc. Initially negative ions were proven for its effectiveness in treating fatigue, high blood pressure and asthma but the research conducted in the laboratory on animals by Dr. Kusturica has proven that negative ions are also very effective in treating cancer. In a research led by Dr. Kusturica, different types of cancer cells were transfused into rats. One group of rats was induced with negative ions each day (experimental group) while the other group of rats was not intervened (control group) to compare their survival rate. The results showed that the rats which were induced with negative ions lived on an average of 59 days, while the rats which were not intervened lived on an average of 34 days. In other words, the rats from the experimental group lived on an average of 25 days longer than the rats from the control group. Some rats in the experimental group even lived for more than 80 days! Hence, it is very clear from that experiment that negative ions have life-prolonging properties. In another study conducted by another research team, cancer cells were transfused into small rats (about the size of a quail egg) to determine the proliferation rate of cancer cells in them. One group of rats was induced with negative ions while the other group of rats was not intervened. The results showed that the cancer cells in rats which were not intervened increased on an average of 58 mg per day, while the cancer cells inside the rats which were induced with negative ions increased on an average of less than 27 mg per day. It was even more amazing to find out that the cancer cells in about one third of these rats showed significant decrease and eventually total disappearance! The presentation of this research finding has gained international interest. Cancer cells are not formed within a day. Experts have estimated that one out of every 3.7 persons is affected by cancer. 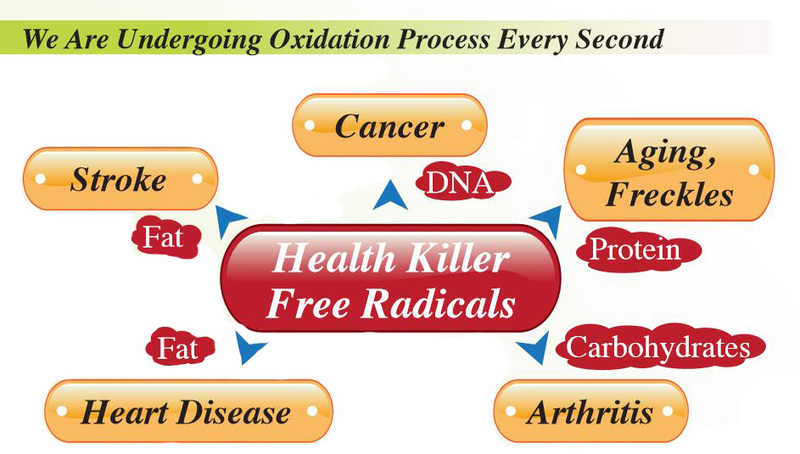 Changes in the environment, diet and lifestyles produce numerous free radicals in our body. How do we stabilised these active free radicals? Let’s start with what is free radical? A free radical is any particles that has a single unpaired electron in an outer shell. All particles such as atoms, molecules or ions are stabilised by paired electrons. As free radicals are lack one electron, they move around freely and react easily with other compounds. In our body, this type of reaction causes damage to the cells as it changes the structure and function of the cells to become abnormal. It leads further to chronic diseases such as cancer, cataract, diabetes, arthritis, heart diseases, arteriosclerosis, Alzheimer's, stroke, etc. Medical literature presented on more than one hundred different illnesses that caused by free radicals. How do we stabilise free radicals and reduce their negative impact on our body? Negative ions can deoxidise free radicals, prevent them from being absorbed by the body. Negative ions can also purify blood, revitalise cells, enhance the immune system and balance autonomic nervous system. In 1950, Dr Haskell applied negative ions to patients with hypertension and found out that the negative ions significantly lowered their blood pressure. No significant effects were observed when positive ions were applied. It was found that negative ions was also effective against bronchial diseases like influenza and asthma. There are no signs or symptoms will be noticed even if 70% of a blood vessel in our body is blocked. Would you have any feeling if your blood vessel is blocked? Most people assume that we need to pay attention to heart problems only when we are getting old. Most people do not know that the rate of plaque formation in our blood vessel is speeded up after we reach the age of 30. Fatigue, unhealthy eating habits and the lack of exercise speeds up blood vessels aging and damages. All experts recommend: Prevention is better than cure. How do Negative Ions Enter the Human Body? 15% through breathing, 85% through absorption by our skin. Negative ion fibre fulfilled the above mentioned requirements and it is a healthcare method that can be worn 24 hours a day. The book entitled An Approach to Health says : Negative Ions, which was written by a Japanese health preservation practitioner, Dr Lino Setsuo, states that only 15% of the total negative ions that exist in our surrounding can be absorbed through our lungs. The other 85% are blocked by our clothes, thus cannot be absorbed. In 1938, the Japanese High Technology Fibre Manufacturers started their researches on healthy fibre which is good for the human body. As a result of collaboration among the experts in the field for more than twenty years, negative ion fibre which uses the exclusive technology based on the principle of friction was produced in 1955. Over 60 years, the negative ion fibre produced remains the only one “permanently effective” negative ion fibre in the world. The exclusive technology used for the production of anion fibre is still not being duplicated. Why Is There A Need to Wear A Complete Set of Negative Ion Clothing? According to the book entitled An Approach to Health : Negative Ions, there will be healing effect if there is 100,000 to 500,000 of negative ions in one cubic centimetre (cc) of air. On the other hand, a professor in Japan Toho University, Dr. Maki Takada points out from the perspective of serology that an input of 300v negative ions can improve human physiological function and can promote health and longevity. Negative ions protect your health 24 hours a day. Absorption of negative ions from head to toes for 24 hours can promote blood circulation and cell metabolism. It also promotes health in the lymphatic system, skeletal system and nervous system. According to Traditional Chinese Medicine, night time is the best time for cell restoration hence bedding is the most important coupled with wearing negative ion clothing, your health will be taken care of 24 hourly. Neuron : Insufficient calcium intake will lead to emotional instability, memory impairment, insomnia, tremors, leg cramps, etc. Related to contraction of muscles, which includes the contraction of the heart muscles, peristalsis, contraction of blood vessels. Lack of calcium might lead to constipation, diarrhoea, palpitations, chest tightness and inconsistency in blood pressure. Related to blood coagulation and purification. It also plays an important role in reducing cholesterol and uric acid in our body, preventing arteriosclerosis, myocardial infarction and stroke. Chronic loss of bone mass will lead to osteoporosis, the symptoms includes body aches and knee pain. Related to reproduction cells: It enhances the vitality of sperms and increase the conceiving probability among women. 2) There are two forms of calcium in human body: 99% of calcium exists as calcium hydroxyapatite, stored in the bones; while another 1% exists in the form of ions, mainly found in the cells. When there is a lack of calcium ions in the cells, the calcium in the bone will be released into blood. 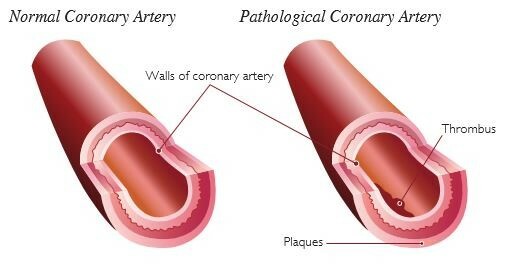 Unfortunately, this type of calcium is not able to enter into the cells, thus it will be accumulated in the blood and increases the viscosity of the blood which will lead to heart related disease such as arteriosclerosis. As a consequence of the loss of calcium from the bone, it will lead to serious health problems. However this condition can be improved by taking L. Acidophilus Calcium. Excellent absorption: It is added with CPP III (casein phosphopeptides) and vitamin D3, which enhance its ability to be absorbed and retain by human body. Excellent water solubility: It is 3800 times more soluble than the calcium phosphate (such as cow bone powder) and 6800 times more soluble than the calcium carbonate (such as sea shell powder) available in the market, thus easily absorb by human body. Safety : Certified by the Food and Agriculture Organization of the United Nations (FAO) and the World Health Organization (WHO). Researches have shown that the lead content in bone powder is the highest, followed by sea shell powder. Healing reaction is a reaction that takes place when human body changes from unhealthy to healthy condition. Symptoms of sickness at initial stage: Occurrence of reverse reaction depends on the seriousness of the illness. What leads to healing reaction? Symptoms of sickness at initial stage: Changes in the environment leads to pathological changes in the body tissues. Antibodies help to restore the affected body tissues back to normal. Sick condition : Antibodies fail to defend the body against pathogens, thus we fall sick. Promotes cell metabolism in the organs at a deeper level. 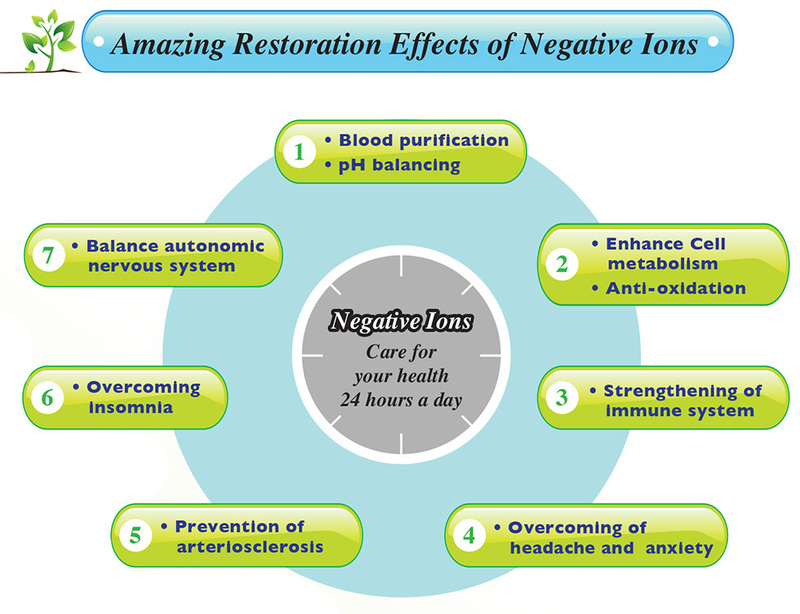 At the beginning stage of using negative ion products, due to the differences in the physical fitness of individuals, the reverse reaction symptoms appears also differ. However, the symptoms that appear are not due to the side effects of the products. Please find below examples for reference: increase in soreness sensation, increase in pain sensation, increase in numbness sensation, throbbing pain, drowsiness, feeling warm, feeling cold, increase in urine volume,increase in sweat volume, flatulence, increase in phlegm secretion, sleepiness, hot flushes, rashes, diarrhoea, swollen skin, increase in breathing rate, increase in heartbeat, increase in secretion, emergence of dormant diseases, dry mouth, being energetic, increased alertness. The symptoms mentioned above differ among individuals. Do drink more water if you feel uncomfortable and consult your product introducer on how to adjust your clothing to speed up the detoxification process until the reverse reaction symptoms subside.